American Jesus And The Religion Of The State. I believe in the true meaning of the separation of church and state. Actually I believe in the separation of state and everything. But nonetheless; nowhere in the Constitution do the words “separation of church and state” appear. This phrase has become the most twisted phrase in modern vernacular pertaining to the U.S. Constitution. The founders of the United States were opposed to a state sponsored church. It really is as simple as that. The first amendment guarantees that Congress shall not establish a national religion. On the flip side of that it says Congress cannot prohibit the free exercise of religion. Here we are living in modern times and the church has put itself in a box. Stifling it’s right to freely exercise the right to exist independently of the state. Far too long the church has slept quietly while major denominations and prominent leaders pimp themselves out as cheap whores to political special interest groups and their party of choice. Statism and idol worship have even crept their way in to the church like a deadly silent plague cleverly disguised as patriotism and honor. The church should be governed solely by God and led only by the Holy Spirit without pagan practices and worldly influence. Most American churches are adorned with idolatrous symbols and led by those who are more influenced by political winds than they are of the Holy Spirit. Anyone that has spent anytime in Sunday school knows the story of the three Hebrew boys; Shadrach, Meshach and Abednego who were thrown into the fiery furnace. King Nebuchadnezzar ruled the land during their time and he made a giant image of gold demanding all his provincial officials bow and worship it. Anyone who refused would be thrown into a blazing fiery furnace. The Hebrew boys watched over the province of Babylon at the time of the idol’s dedication. At the dedication some astrologers brought it to the king’s attention that the Hebrew boys neither served the king’s gods nor worshiped the golden idol. King Nebuchadnezzar was outraged and interrogated the boys. The king gave them an ultimatum; either worship the idol or be thrown into the fire! The boys refused so the king became enraged and had the furnace heated seven times greater than usual and he threw them in. To the king’s amazement the boys not only survived the blaze but were miraculously rescued by a fourth person in the fire. The boys emerged from the fire without even one singed hair on their heads. So great was the miracle that there was no smell of smoke on them and their robes were spotless. Shadrach, Meshach, and Abednego trusted in the one true God and defied the king’s demand to worship other gods and idols. They were willing to give up their lives rather than worship anything or anyone other than their God. It is important to note here that King Nebuchadnezzar did not ask the Hebrew boys to worship the golden idol with exclusivity. He asked them to worship the idol in addition to their God. In many ways modern Christians worship government, in addition to God, much like pagans worship their false gods and idols. They look to government for their protection and sustenance and faithfully expect it to be their supplier and provider. Government is exonerated and its officials are extolled like they have been ordained by God to lord over the populous. Churches very openly fly the U.S. flag higher than the Christian flag and their platforms are often adorned with nation flags. I have no ill will towards the flag and see nothing sacrilegious about businesses or homeowners displaying them if they choose to. Even wording that one hundred years ago would have been reserved for holy objects is now referred to for state objects. For example, if someone were to destroy a U.S. flag the media, and common folk alike, will say someone has desecrated the flag. To desecrate something means to destroy something that is sacred. The word sacred means that the object is connected with God or used for religious purposes. Church choirs sing hymns to the state on or around national holidays and special services are dedicated to honor the state and its vast military industrial complex. All of this without even the slightest apprehension from clergy or parishioners. Within Christianity there are Christian organizations solely dedicated to promoting legislative action and political agendas. While these things are not entirely bad they still miss the purpose of the Great Commission. You will not find one example in the New Testament when Jesus ever condones the use of government or legislative action for a godly end. Furthermore, you would be hard pressed to find one instance or example of early generations of the church promoting political agendas by protesting or boycotting certain groups of society, calling for special amendments to the constitution, or demanding special elections. Boycotts and protests simply isolate Christians from those they are called to minister to. Taking legislative action against those we are called to reach is a non-spiritual attempt to use man’s institution of government to try to achieve something that can only be achieved in the spiritual realm. Even if these organization succeed in their efforts, they have not changed anyone’s hearts or minds. They will have only won a political battle driving a wedge further between them and non-Christians. What Christians fail to see is government is coercive in nature and inherently evil. I cannot imagine the early church singing songs praising their country or lauding their politicians. We must rely on God and Him only. We should pray the Holy Spirit convicts our leaders of their horrendous sins and makes their paths straight. First Timothy 2:1-4 says, “I urge, then, first of all, that petitions, prayers, intercession and thanksgiving be made for all people— for kings and all those in authority, that we may live peaceful and quiet lives in all godliness and holiness. This is good, and pleases God our Savior, who wants all people to be saved and to come to the knowledge of the truth.” It is time for Christians to step up to the plate and do what God has intended for us to do. For too long the church has chased its tail and fervently supported political agendas at a fever pitch. Sadly the American Christian church has become a state religion that resembles a political action committee far more than the Church of our Lord. State worship is blatant in American Christianity and sadly it is encouraged and promoted. 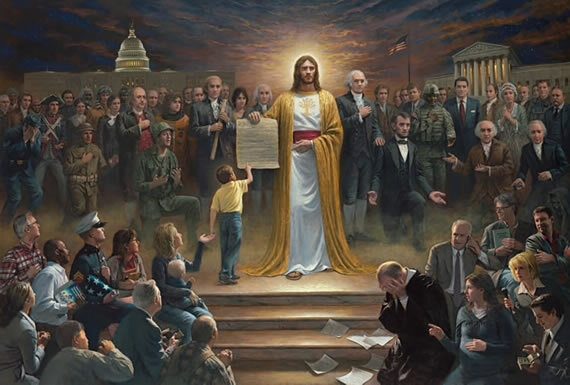 I fear American Christians have made Jesus to be an American Jesus proudly pictured with a Bible in one hand and the U.S. constitution in the other. Do you serve the American Jesus or the Jesus of the Bible?